Yesterday I finished these felt letters for Clementine’s nursery. They had been sewn and stuffed months ago but I had this idea that they would all hang individually from the tension wire that holds up her curtains and then when I tried it and realized they would spin around and half of the letters would be backwards I gave up and for months there’s been a hanging “Cle” in her room with a backwards “e.” The solution ended up being a strand of clear thread which runs through the letters and is looped at the ends so it can hang from nails. And now I’m so geeked about how cool this turned out that I look for excuses to wander into the nursery and stare at it. I will freely admit that the idea for these letters was not mine. I saw similar letters featured in Small Magazine last year and now it is driving me nuts that I just wasted a half hour looking for the page I saw them on and can’t find it. Anyway they are from an etsy shop called MiCiMaLand that sells them in double cool Learn-to-Spell sets like this one. At the time they also offered custom name sets ($2/letter if I remember correctly) but now it looks like they’ve stopped selling them and if I had had half a brain I would have just ordered a set from them instead of trying to make them myself. I waffled about it for awhile but in the end the Dutch Girl in me just had to add it all up and decide that $20 for all TEN letters of Clementine’s name was too much to fork over and by gum I could just make those myself. Kicking myself now, thinking about how long it took to cut out each of those letters and then stitching and stuffing them by hand…did I mention there are TEN letters in her name? This is a classic example of the should-I-make-it-or-buy-it inner debate going awry. And if you are thinking $34 for a full set of hand-stitched letters is too much, you should think again. If you have a child with a sensible short-lettered name, you might yet decide you want to make your own set. For those of you who are still nodding, here’s a brief how-to. 1. Buy some nice brightly colored wool felt (here or here are nice, feel free to share your favorite sources in comments). Acrylic does not look as nice but go ahead if you must. 2. Print out the name using a large font. Block letters work well. Mine were Cooper font size 400 in Word. 3. 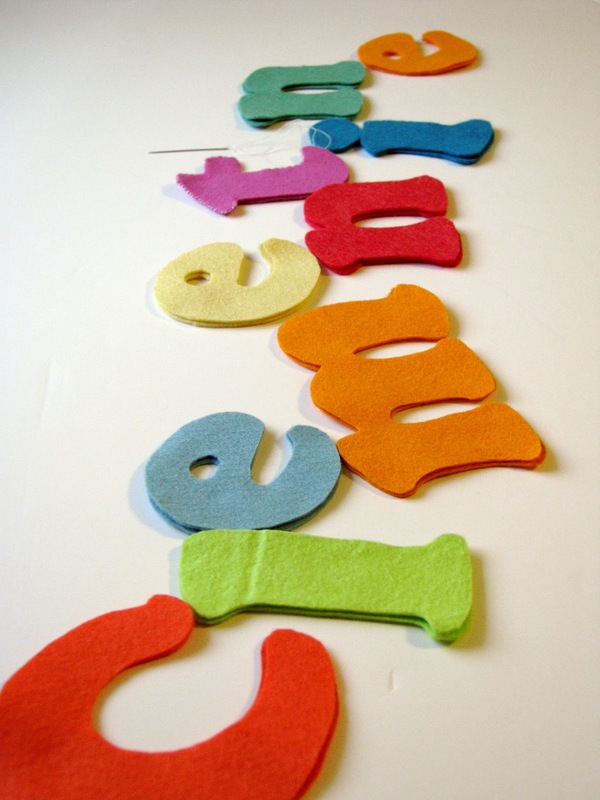 Place a piece of felt over each printed letter and hold it up to a window so the light shines through. 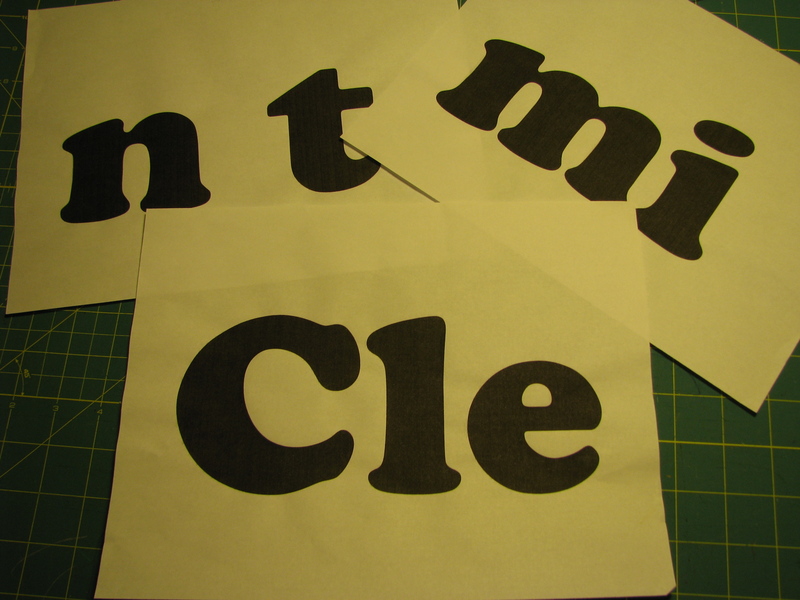 Trace the letter onto the felt with disappearing ink or with a light pencil. 4. Cut letters. I put two layers of felt together and cut them out two at a time. 5. Whipstitch the two layers together around all the edges. For letters that have holes in the middle (like e, b, d), stitch around the holes first, then do the outside of the letter. You can see the stitches pretty clearly in the picture above. Uneven stitches add to the handmade charm of these letters (repeat after me). 6. Leave a hole open so you can stuff the letters. Don’t over-stuff them or the stitches will pull out. Too much stuffing also makes them bend oddly…you don’t want that! 7. Sew the letters shut. 8. Using clear quilting thread or fishing line, thread the letters together, tying the ends of the thread into loops for hanging. Hang and enjoy! These remind me of projects my mom started me sewing with. Felt is the best, with no unraveling and hosts of fun colors. First: those are precious. I love it. Also love the shade of yellow the wall is painted is awesome. Second: where do you find wool felt? I usually only find acrylic and that melts (whoops). Third: if I make some of these, I will print out your hand-stitched charm mantra and repeat it as I go (because my handstitching leaves much to be desired). These look great, I will try it. and my little ones name is Anna, so only 4 letters. I love felt! I made some sachets last Christmas with cheap felt. Stuffed them with scented tissue paper and added them to gifts. It'd be nice to find non-dollar store felt. Look at you rockin' the blog posts :). Go YOU! These are ADORABLE … and the wall color is the perfect shade to set them off. Love it! I really enjoy the simpleness of this design and how beautiful it looks against the wall. It is just perfect. Those are adorable! Another project to add to my list? Great ideas! Thanks. Love the name Clementine – so pretty. I love it!! The colors are just so yummy — I want some of my own! What a fabulous idea project!! I love the name Clementine. My 2 1/2 year old's middle name is Clementine and she quite enjoys walking around saying her full name. "I Zoey Clementine Meeeeeeller!" Thanks for your creativity and love of sharing it with us all! awwww. so cute! Love it. Adorable! You deserve to be proud! Isn't it funny how that works out? Especially by the time you by the nice felt. I LOVE decorating with felt. It's so perfect for children's rooms, too. 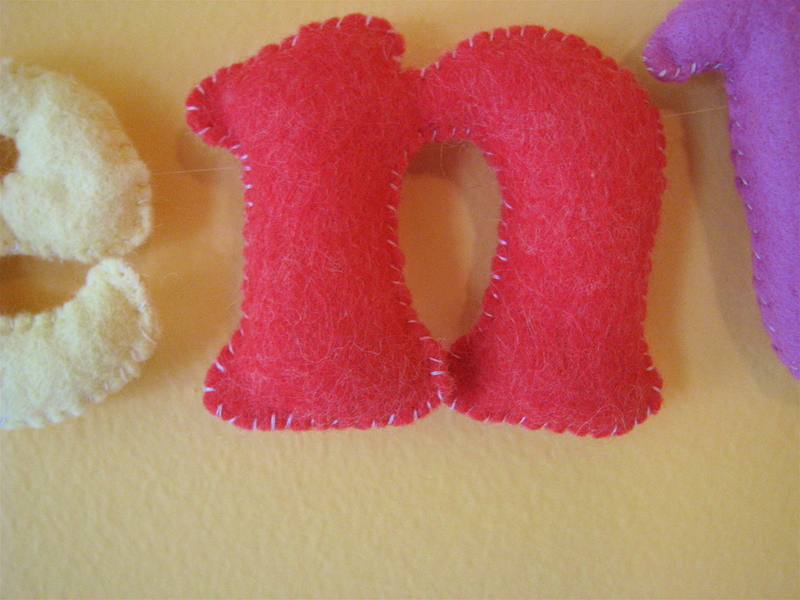 Ok and the banner – I think I just fell in love with felt!! 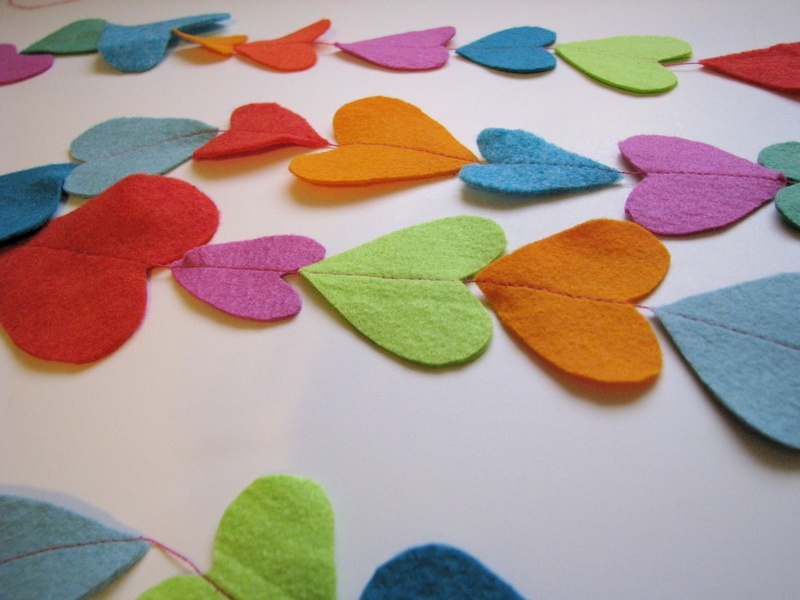 Can you recommend a good idea book for felt crafts?? well, they look great. my sister used to make letters like this for herself and her friends, all monogram-esqe, in the 80s. she was super cool and so are you 🙂 love them. Another project to add to my loonng list of projormaects to make. These turned out so cute!! FYI in an effort to use less ink I always use the "outline" option on the font before I print. Anyway, super cute! I could do this!!! Love it tons. Thanks for the great idea. So cute! I might have to make them for my niece and nephew. 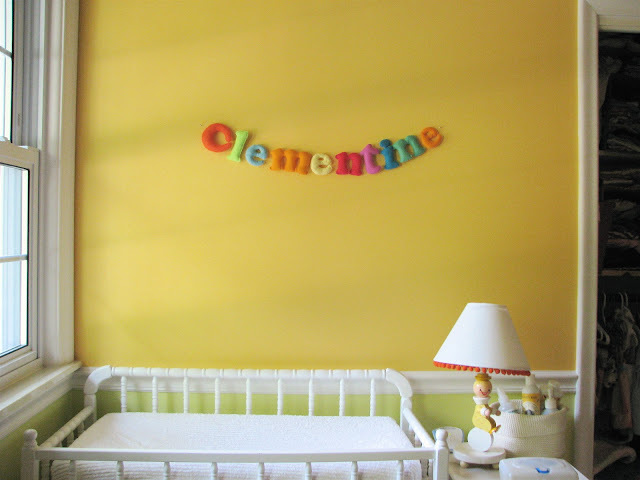 Clementine is such a lovely name, by the way. Those little letters are adorable. I do not have kids .. … so I will have to make them for my pets! Thank you for sharing the how-to. Hi, I'm a newish reader. They are awesome I understannd what you mean about 10 letters, my daughters name is Charlotte, nine letters creating for them can be a big job. I do love it though, felt always makes me smile, I dont know if its the bold colours or it's cozy look? Oh, LOVE. 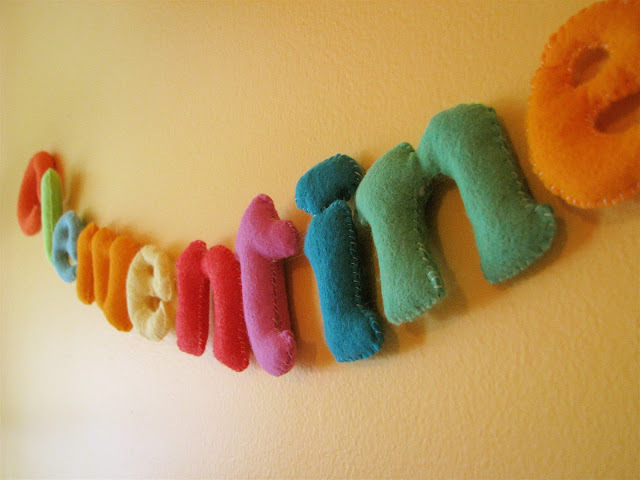 I found a tutorial in my 2010 Crafts Calendar for wall letters…and I think this is the kick in the pants I needed to get these done by Christmas. LURVE. Oh…but that means I need to choose baby boy's name, like, NOW. And, of course, the name we're thinking of has 9 letters…and E's is 9….and M's is 8….OK wow. My poor kids are NEVER going to learn to spell their names!! Love the colors, these look so great on the wall! SUCH a cute idea! I really like the font too! And the colours look so cheery on her wall! These look wonderful – isn't felt great! We displayed our daughters name in many parts of the nursery as well. This is what we ended up doing…. those letters are beautiful, such a fun idea. They're lovely! I love the 3D look you've achieved by stuffing them. I think a few simple homemade decorations look great in children's bedrooms. Rae, those look adorable!!! *almost* as cute as little miss clementine herself!! This is such a very good idea you have here. I also remembered my room when I was young. I have my name on the top of my bed but it was not made of felt. Those letters are fab – what lucky children to have such a talented mum! Your blog always has great ideas. I made the heart garland a while back – a great success! Thank you! Oh my that's adorable! My "I can make that" gene often leads me astray, so I feel your pain. BUT they turned out great! 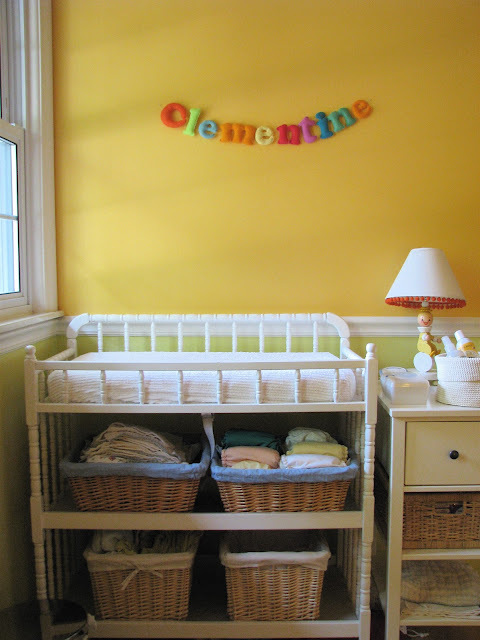 And I love, love, love the color of Clementine's walls. Yum. okay, as always – you rock. we've been wanting some fun letters for the bean's room, but haven't done a damn thing about it. and now i can just do it with your super easy tutorial! Very cute. I am filing this away in my ever-growing mental "projects to try" folder. 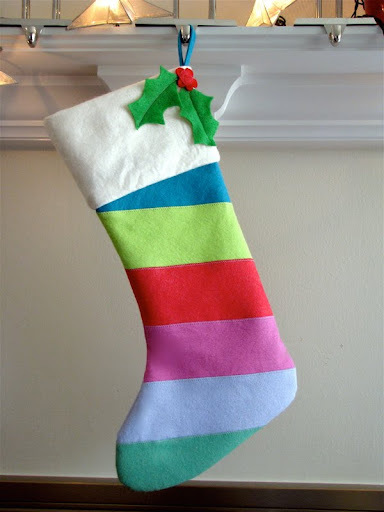 Love this, I have a ridiculous amount of felt to use up, so I'll make some for Christmas gifts this year I think! Thanks for the inspiration – this might be a craft project that I could actually succeed with ! So cool! I need to do this. Unfortunately my daughters names are Adeline & Beatrice — not quite as long as Clementine, I guess! This reminded me of another project I saw on another blog (don't remember whose) — a magnetic fabric alphabet for the fridge. I heart the heart garland. Please, can you make us a tutorial of it? I LOVED these little felt letters and featured them here. So cute! Really lovely! Thanks for sharing! I'll try to do some for my babies. Adorable!! I love the name Clementine too! 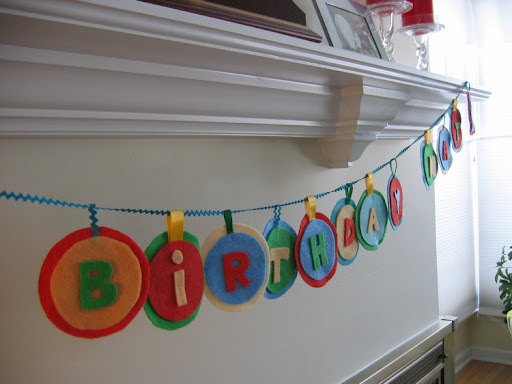 I might make a Happy Birthday banner and share it on my blog…..will definately be linking back if/when I do! These are wonderful! Somehow I missed this post the first time around and I just found it through the little roundup over on The Long Thread that she did yesterday or today. Anyway, love these. I think I may make an alphabet set to use for preschool time. Thanks so much for sharing! Beautiful project! So inspiring – thank you so much. I have added a link to your blog in one of my blog posts. Have a wonderful week! Isabela/Ooh Leela! Thanks for the inspiration! I just finished a few sets of these up…still 1 more to go! Well, this post inspired me to create my own alphabet set…in both upper and lower case. They turned out great!! I love them! I thought I was the only one going ga-ga over these letters. Personally, ^0 bucks is alot for me to shell out so I am going to make the 26 letters myseld. It took me three hours to make a and b but I keep telling myself.. 60 bucks 60 bucks because one way or another, i want want want these cute stuffed alphabet!! Hi Rae, Its wonderfull!!! I was looking for how-to-make-stuffed-letters everywhere last week, n today accidently stumbled into your page. Got a question though, what sort of stuffing was used and how did you manage to insert the stuffing into all those bended letters so well ?? Any chance you’d be willing to make an sell me an alphabet set of these? Man, am I ever glad we named our daughter June! Thanks for the tutorial. Mine turned out great. This is such a cute project! Where did you get your felt? I love the colors that you picked. I love this! 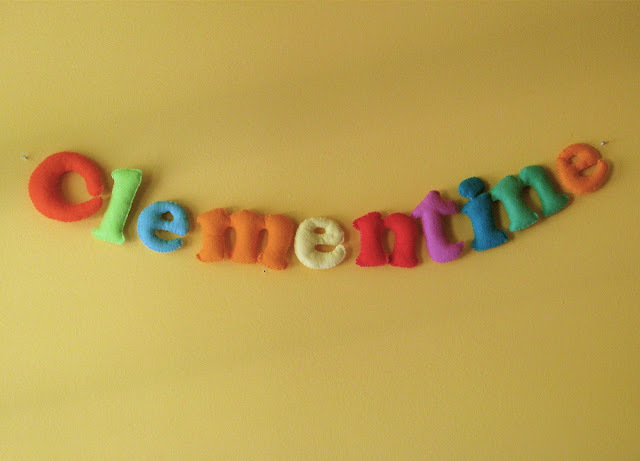 My daughter’s name is Clementine too!